Features the wonderful moisturizing shampoo and nourishing conditioner (each 17 fl. oz. / 500 mL), crafted from Natural Colloidal Oatmeal and pure botanical extracts like Sweet Almond Oil, Coconut, Echinacea, Shea and Green Tea. This duo use gentle ingredients that combine for an aromatherapeutic experience that calms, cleans, moisturizes and soothes. The Moisturizing Shampoo is made from Natural Colloidal Oatmeal and pure extracts of Sweet Almond Oil, Coconut and Echinacea, to promote healing and naturally disinfect. 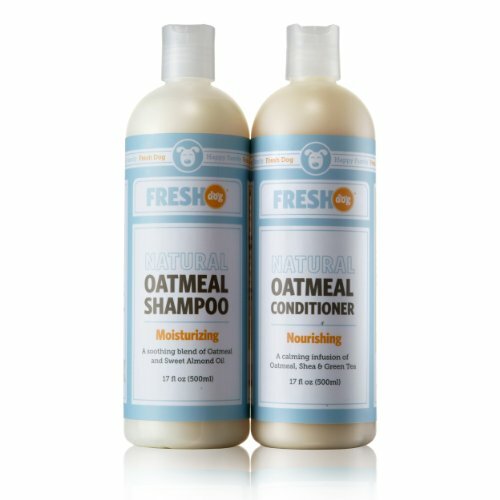 The Nourishing Conditioner features Colloidal Oatmeal for its natural relief for dry, itchy, irritated skin. Coupled with all-natural oils are packed with Vitamin E and Essential Fatty Acids, this gentle formula moisturizes, repairs and protects. Leaves your pet's coat healthy, shiny and soft. CRUELTY FREE - Tested with love on humans and dogs. Made in the USA. GENTLE - Does not strip topical flea and tick treatments. Free of parabens, phthalates, GMOs, triclosan, synthetic fragrances, and artificial color/dyes. SAFE FOR HUMANS - Fresh Tip: Bored with your human shampoo? This set is safe for you to use, too! If you have any questions about this product by Fresh Dog, contact us by completing and submitting the form below. If you are looking for a specif part number, please include it with your message.